Cast: Yamada Ryosuke, Kawaguchi Haruna, Daiki Arioka, Asari Yosuke and Narimiya Hiroki. This is the fourth season of the drama following young Kindaichi Hajime - the grandson of the great detective Kindaichi. Finally at the fourth season of this drama and I know I should have expected it, but the deaths are way too circumstantial for Hajime to be there every single time. 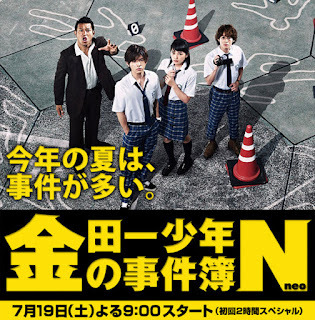 I mean more people die in this drama than average, and those three are witness to too many murders compared to the regular high school student. That said, besides the acting not a single thing was even interesting, and yeah I count the murders in too. I didn’t know who the murders were a lot of the time, but usually I could guess when a famous/known actor/actress guest starred there was a 95% they were the killers, and sometimes the way of killing was just ridiculous. Also after the murders, and confessions of course, Hajima had this idea of ‘understanding’ the killers and talk to them - which was bull. I mean the way these people are killed is just coldblooded, why would you need to talk to them? Sorry I don’t see remorse or regret, so yeah. All in all an interesting drama with loop holes.